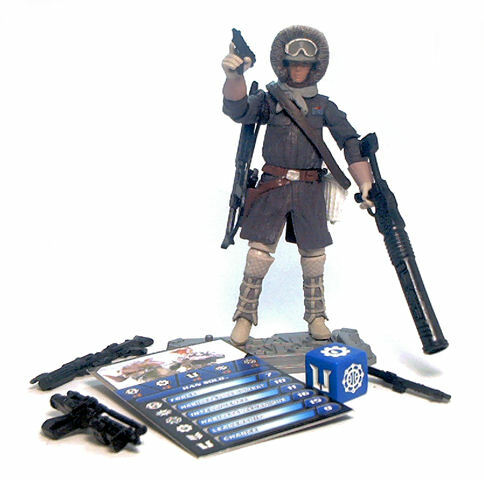 A couple of years ago, when Hasbro was charging top dollar for fancy packaging with their Vintage Trilogy Saga Collection line (VTSC for short), they included an updated version of one of Kenner’s coolest Empire Strikes Back figures, Han Solo in Hoth Gear. 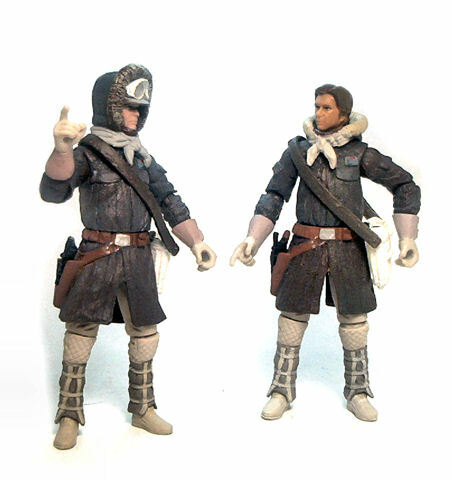 In the San Diego Comic Con photos of that year, the figure showed two alternate head sculpts, one with the hood down and one with the hood up, as well as a brown coat, which in turn fueled some debate at several opinion forums regarding the screen accuracy of the figure. 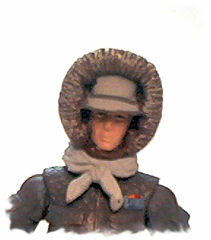 By the time the figure hit stores, only the hoodless head was included, with the hood being a removable piece that sat around Han’s neck. 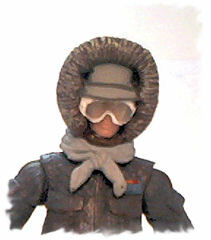 The hood-up version was released next year as part of a Hoth themed Battlepack, only this time the coat color was a dark blue closer to the color on the original Kenner figure. 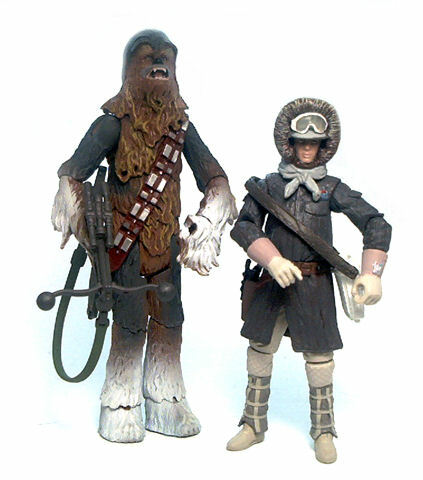 Fast forward a few more months, and Han Solo in Hoth Outfit gets released once more, only this time in the Saga Legends line. 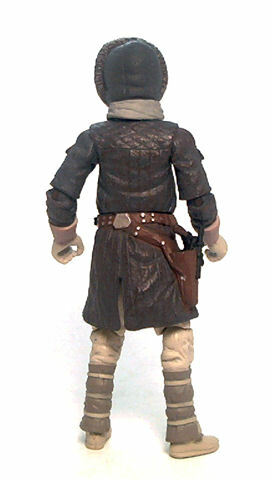 The figure this time comes with the drawn up hood, a brown coat and a load of extras that could possibly make it the best value deal on this character. I’ve said it before and it’s worth repeating: Hasbro’s sculptors are among the best of the best when it comes to 1:18th scale figures. The clothes are very detailed and full of textures. There is nary a single surface that lack either a wrinkle, a fold or a quilted texture in this figure, other than the soles of the feet. The head sculpt seems to be based off the same Han Solo head we have seen used before in several other versions of the character, with the hood fabric and furry trim sculpted over the hair and snow cap underneath. A neat feature is that there are indentations both above and below the visor that allow the included goggles to clip either over Han’s eyes or his forehead. 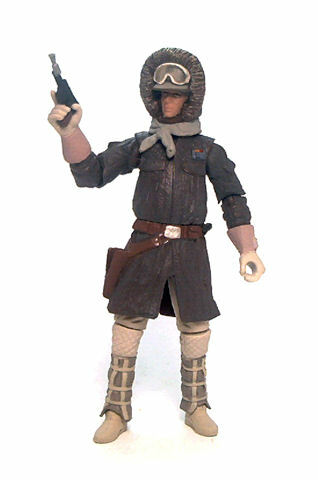 I personally prefer to leave the goggles over the hat because this is the look the vintage figure has, and with the goggles on, there just seems to be a lot of empty space over the visor. Balljointed neck. Works mostly as a simple swivel. Swivel wrists. More like glove cuts at mid-forearm height. Peg & hinge hips. Very limited by the rubber coat tails. All of the joints are expertly hidden in the costume design, which is great for the figure’s appearance but causes the joints at elbows, knees and ankles work at their best only when the limb is aligned perfectly forward, as the slightest deviation would not allow a 90° bend. As a whole, the paintjob is merely decent. The figure is molded mostly in the correct colors from the start, so paint apps are fairly minimal, but two things stand out for me. One is that the coat was given a rather ashen looking wash that sort of kills the warm brown hue from the plastic underneath. To be fair, I don’t really know if this is a realistic look for the coat of someone who has been out in the middle of a heavy blizzard, but it kind of makes the figure look a little dull. The real problem, though, is that Han’s face is also painted in a grayish pink hue that looks downright unhealthy and this, more than anything else, is what caused me to wait until this version of Han went on clearance before getting him. 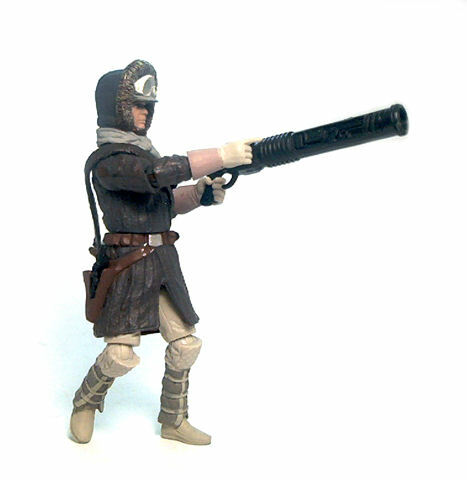 On a brighter note, the Saga Legends release of Han solo in Hoth Gear comes with loads of weapons besides his trusty blaster pistol. 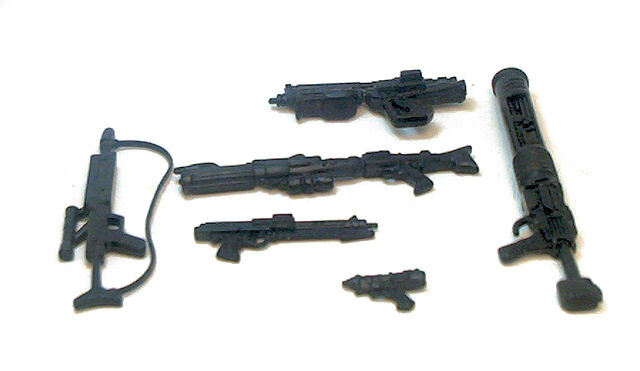 All of these we have seen before released with other figures and/or Saga Legends weapon lockers, but you can never have too much guns. 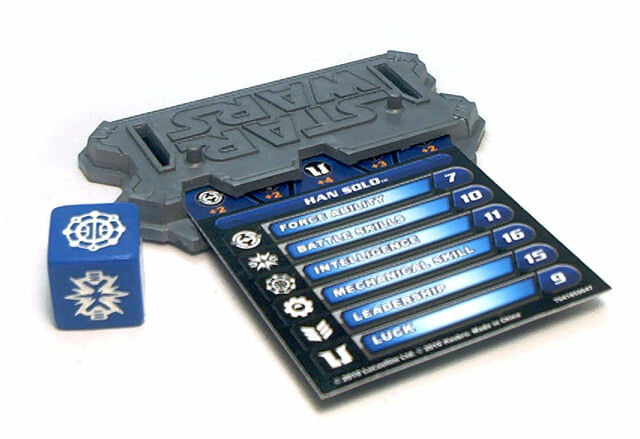 In addition to the weapons, Han comes with the Galactic Battle Game paraphernalia common to the 2010 SL line: A silver plastic display base, the corresponding blue die and a game card with stats printed in french and english. While I am still unconvinced that brown is the correct color for the coat and the face color looks plain wrong , truth is this figure has been growing up on me these past few days.